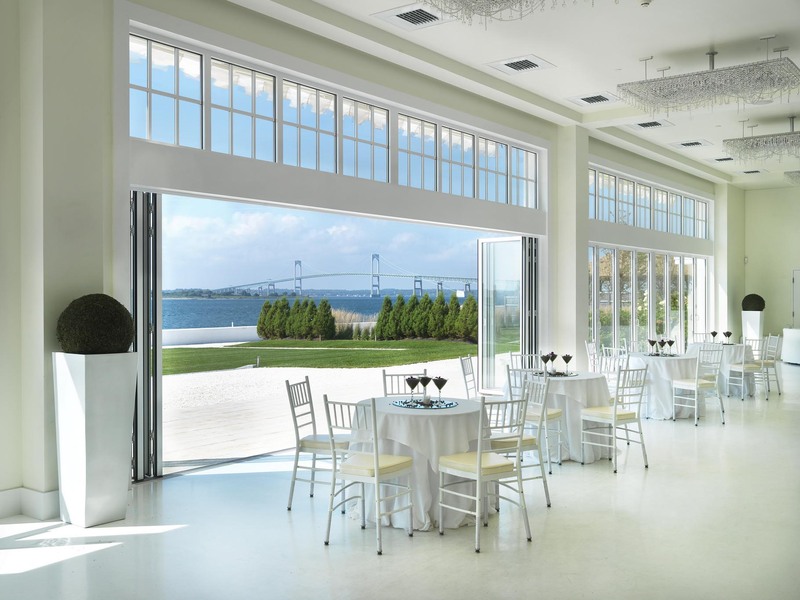 "This six-acre site and it's two banquet halls" were designed to accommodate weddings and similar large functions regularly," says Ben Gathright, marketing director for Tappe Associates, Inc., the architectural firm hired to renovate Belle Mer, near the scenic port town of Newport, Rhode Island. "For the renovations of the two existing buildings, a large addition and extensive site improvements, the client wished to leverage the surrounding natural beauty by blurring the line between interior and exterior space." This was especially true of the Water Salon, Belle Mer's premiere venue. The owners of the hospitality facility envisioned completely opening one wall that faces the Ocean Lawn area. Enclosed with glass, it would provide spectacular views in any weather, year-round; opened up, it could invite in sea breezes and salt air. "While there are a number of manufacturers whose systems might have been adequate, NanaWall's reputation inspired our confidence – and the client's trust." 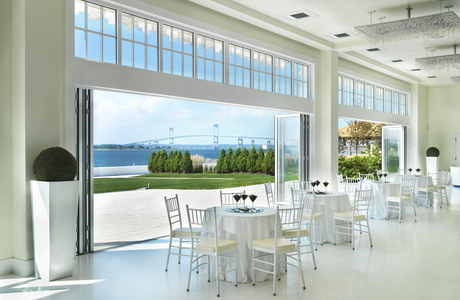 This elegant vision would have to be backed by durability, however: Not only would the glass wall need to retract daily to accommodate the venue's changing schedule, but the system would have to endure the powerful storms of Atlantic winters. In the end, Tappe's design team specified a customizable SL70 aluminum framed folding system, along with matching transoms, in white framing to match the Water Salon's soft white, minimalist elegance. The 37 monumental outswing panels feature thermally-broken engineering for energy efficiency and occupant comfort. 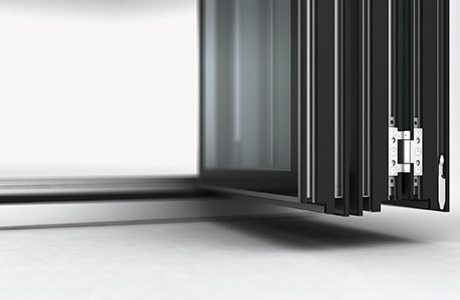 Before specifying NanaWall for Belle Mer, Tappe's team considered other options, though few offered the folding wall system's flexibility and ease of use. But ultimately, the designers and the client went with NanaWall because of the brand's prominence. "While there are a number of manufacturers whose systems might have been adequate, NanaWall's reputation inspired our confidence – and the client's trust," concludes Gathright. 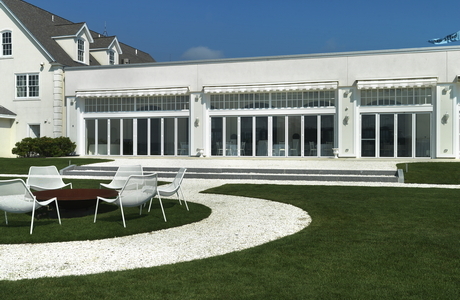 Bringing natural beauty directly into the space, NanaWall's SL70 system provides a sophisticated and manageable solution for transitioning between open-air and enclosed events, says Tappe Associates’ Gaithright. 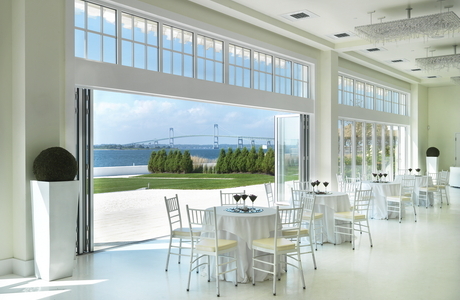 "And the glass wall helps create a dramatic facility that fully capitalizes on the breathtaking ocean views," he adds. 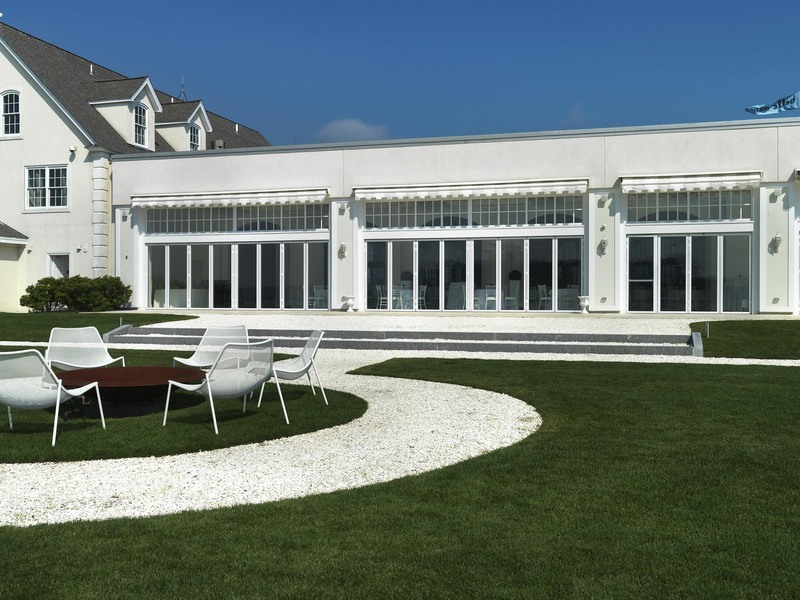 Located on Goat Island in Narragansett Bay just East of Newport, Belle Mer's six stunning acres boast spectacular views of the Bay and the Narragansett Bridge. 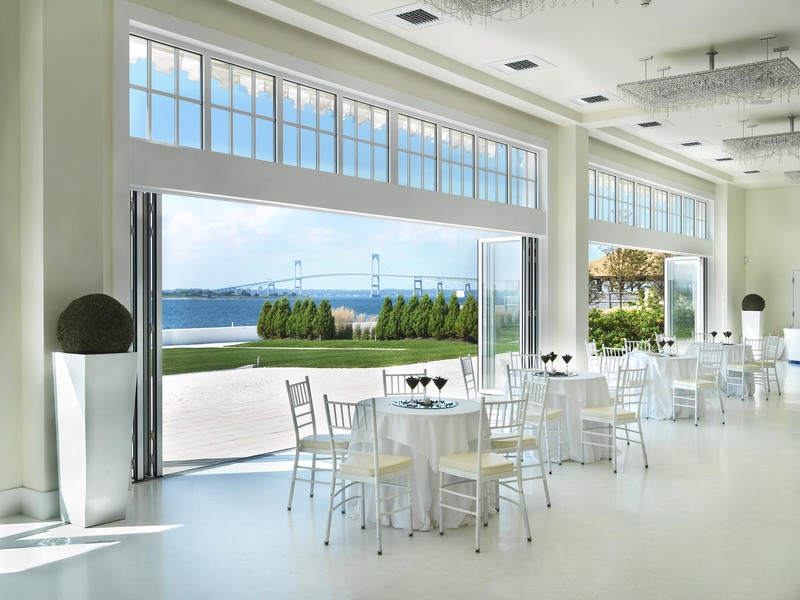 Tappe Associates was challenged to help their client secure Belle Mer's position as a second-to-none event facility for Newport-area gatherings of all kinds. 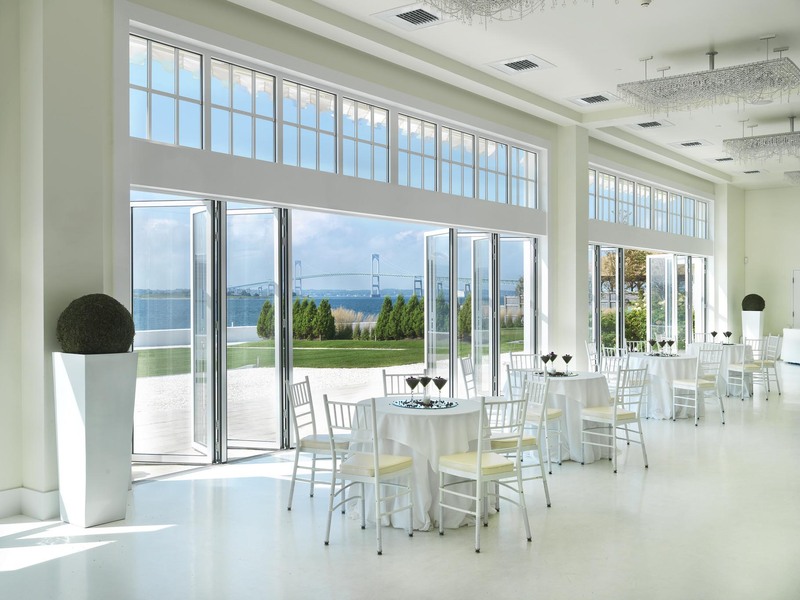 The proprietors of Longwood Events, the owners of Belle Mer, were successful Boston restaurateurs before transforming one of their popular restaurants, Veronique, into a unique venue for private gatherings. 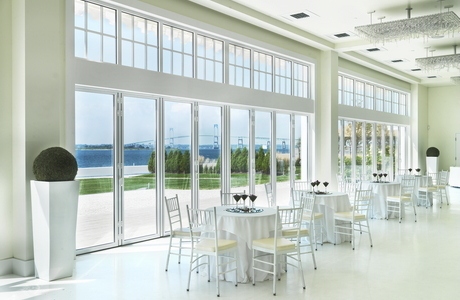 The success led them to open more such facilities, including their third, Belle Mer, in Rhode Island. The grounds, including the sumptuous Ocean Lawn, are marked with simple geometric paths leading to "ceremony circles," water features, fire pits and an ocean path. The two main structures on the site are separated from one another by soundproof walls that allow for adequate isolation to hold simultaneous private gatherings. 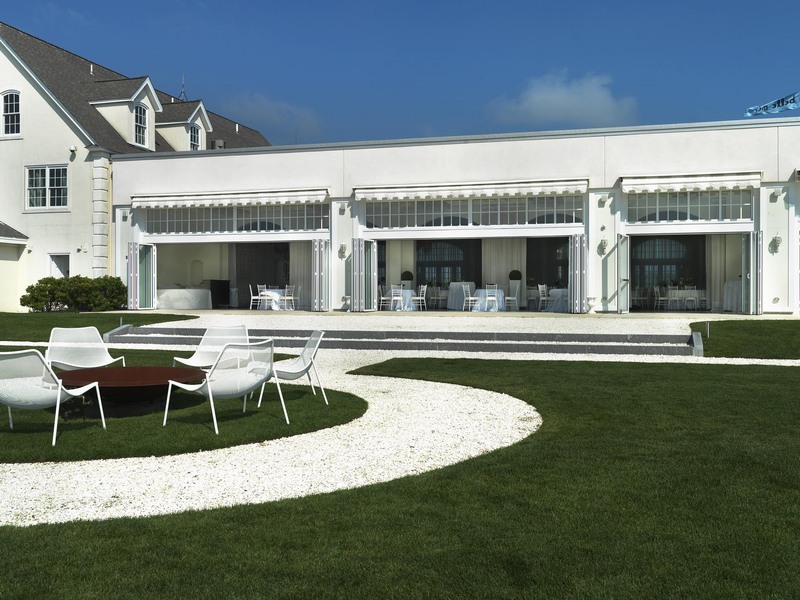 South of the wall lies the Island House, a smaller venue for parties of up to 500; north of the wall is the Water Salon, known for its soft white minimalist glamour, accented by crystal chandeliers, floor-to-ceiling flowing white sheers and two fireplaces. 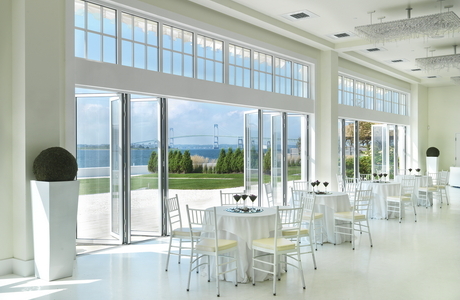 NanaWall’s monumental glass folding panels extend the excitement of the Water Salon’s attractive interiors by reminding guests that they are on a fabled New England coastline. 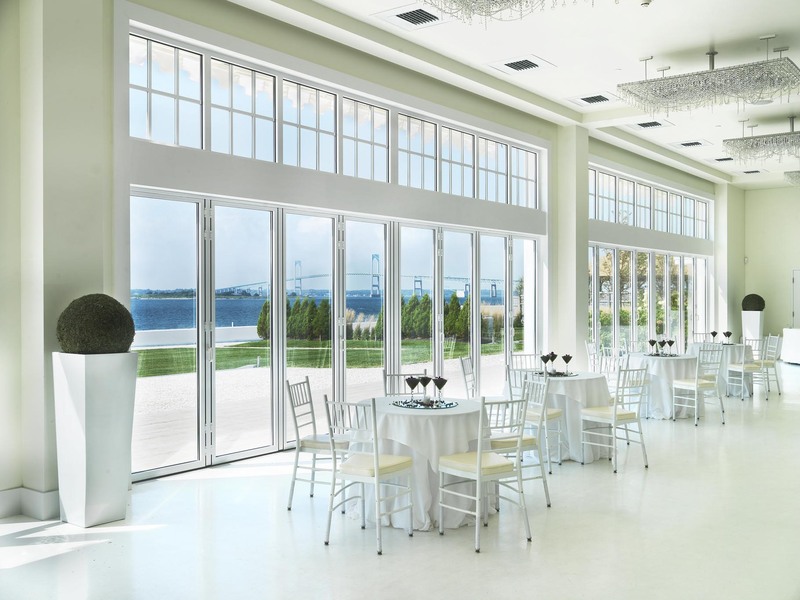 Open to the natural beauty or closed off for efficiency and protection, the operable system adds a valuable touch to the weddings and banquets held here.